This entry was posted in Substance Abuse and tagged Addiction, Preventing Misuse, Signs and Symptoms, Support on June 14, 2016 by Baxter Ekern. Contributed by Azure Acres clinical team member Kathryn Taylor, MA, LPC/MHSP. Marijuana is a heavily abused addictive substance that is used by many teens and young adults, mainly due to its easy access compared to other controlled substances. It comes from the plant genus cannabis and is often consumed through smoking or adding it to food or drinks. Marijuana use has seen a sharp increase in recent decades, particularly since the 1960s. Parents often worry about marijuana use in their teens or young adults. While this drug has become more widely accepted, marijuana is still illegal in many places and the abuse of marijuana can lead to cognitive deficiencies that can alter a person’s life and way of living. Being informed about this substance and the ways to battle it is the best weapon in overcoming addiction for any family member. 1) What is marijuana and how is it taken? Marijuana is derived from the cannabis sativa plant (cannabis sativa, cannabis indica or cannabis ruderalis) and can either look green, gray or brown. It normally features dry, minced leaves, seeds and stems. The common way to use marijuana is by smoking, which most users would call a “joint,” but it can be also smoked in a pipe or bong, or, more recently, a smoke vaporizer. Some people heat the oil from the cannabis plants and use it to make food items, especially baked goods like brownies. Over the years, this drug has earned many nicknames, such as pot, weed, grass, Mary Jane and herb. Other terms used are boom, skunk, ganja or gangster. 2) How do I know if my child is using marijuana? Signs are easy to see if someone is high on marijuana. Some indications of marijuana use are dizziness, an inability to walk properly, laughing unnecessarily, bloodshot eyes or short-term memory loss. In some cases, marijuana use can lead to seclusion, paranoia or uncharacteristic silence or lack of communication. Schoolwork and driving will be impaired, as will decision-making abilities. Aside from those signs, which can only be visible when an individual is high, parents should also be mindful of changes in a teen’s behavior, attitude and way of talking. There may also be changes in school performance. These symptoms could also be linked to other drug abuse. The answer is a resounding “yes,” demonstrated by the thousands of cases of marijuana addiction recorded every year. Marijuana leads to a psychological addiction, or a compulsive belief that the individual needs this substance in order to function. Often, users develop a tolerance to this drug, and desire more and more of the substance in order to feel the original effect. Addiction starts when dependence to the substance is developed and there is a compulsion to use it frequently. To be clear though, not every person who uses marijuana becomes addicted to or dependent on it. For instance, there are cases of marijuana use that are medicinal and are prescribed by physicians. 4) Can marijuana affect the brain negatively? Studies have proved that chronic use of marijuana can lead to short-term memory loss. While being high will already make it difficult enough to retain memories or perform regular tasks, marijuana also affects the nerves in the brain that are responsible for keeping short-term memories. Some studies show that frequent use of marijuana can kill brain cells. Further studies are being done to learn more about the effects of marijuana on the brain. 5) What are the long-term effects of marijuana? There are a number of ways that marijuana can negatively affect the human body. For instance, cognitive skills can be impaired through frequent use, such as being unable to retain memory or experiencing a declined ability to process ideas. There are also long-term physical effects that can arise, such as cancer from smoking (which is also linked to other vices co-occurring with marijuana use), weakened lungs and respiratory system, and a weakened immune system, all of which can lead to physical impairment or even death. Many parents think that avoiding the issue altogether can make a marijuana problem go away. Unfortunately, this is not an effective way of treating marijuana use disorder. Marijuana is so widely known and commonly used that anyone can have access to it. 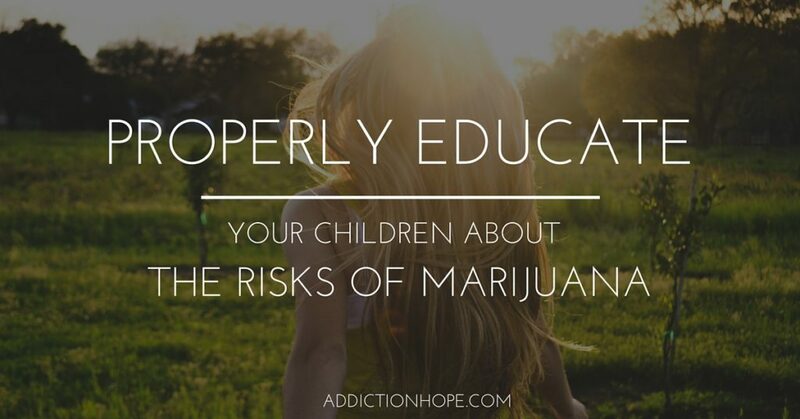 The right thing to do is to properly educate children about the risks of this addictive drug. Marijuana is a dangerous drug and can have physically, mentally and emotionally deteriorating effects on a person’s life. Peer pressure, being exposed to others who use marijuana, and having access to obtaining the drug are only a few of the reasons that can lead an adolescent to become addicted to this drug. Proper education and protection from this illegal and addictive substance is the best way to keep it away from your family. Community Discussion: Share Your Thoughts Below! Do you have concerns about marijuana use among young adults? Why or why not? What concerns you the most? Please add your answers to the comment section below. About the author: “5 Marijuana Facts Parents Need To Know” was written by Azure Acres clinical team member Kathryn Taylor, MA, LPC/MHSP. Kathryn has several years of experience working in dual diagnosis addiction treatment, women’s issues and trauma treatment as a licensed mental health counselor. Site Description: Azure Acres is a comprehensive treatment center that helps adults ages 18 and older find healing from substance abuse and/or co-occurring mental health concerns. Azure Acres offers residential treatment, outpatient care, and detox services in Sacramento, California. Outpatient care is offered in Sacramento and Santa Rosa, California. With over 55 years of helping patients and their families find wellness, Azure Acres is a premier location for all recovery needs.